Hi, I have NXT Pro 3, and it would seem that my disc drive is no longer being detected. It had been working fine previously though. I am currently running Windows 10 64-bit and have a standard dvd burner. Windows sees it fine and can read and write discs with no problem. In the Roxio program I opened the "get disc information" from the Tools menu of the home screen, and it does show that I have a drive, but when I open any of the actual programs (such as data disc or burn disc image), it shows "no drive detected." You're running Ubuntu as your OS? 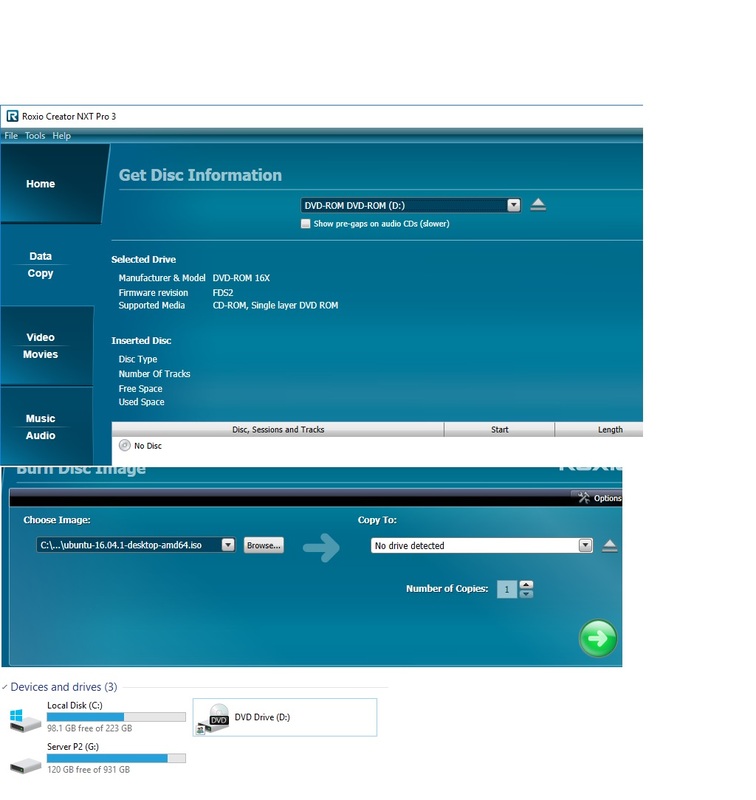 IThe Roxio "Get Disc Information" is recognizing your drive and indicating that your drive is a 16x CD/DVD-ROM running firmware revision "FDS2"
That makes me think your D: drive is a Sony DDU1615 HH 16X CD/DVD ROM drive. It's the only drive I can find running that firmware, and it matches the other drive information that Get Disc Information is showing. If that is the case, the Roxio software is correct to show "No Drive Detected" to burn your Ubuntu ISO, because there is no burner detected. The Sony DDU1615 is a read-only device or ROM drive. Please check the drive again, because if Windows can 'write discs with it no problem' then the machine has a serious identification problem.